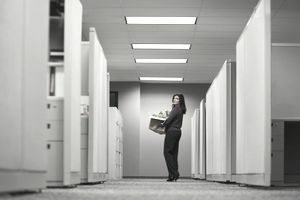 Most private-sector employees in the United States are employed at-will, which means that their employers can terminate their job at any time, for any reason or no reason at all—barring discrimination. This means that many newly terminated employees are taken by surprise. While some employers may provide warnings and advance notice of termination, others move swiftly and unexpectedly. If you've recently lost your job, you may be wondering what your rights are. Because a layoff can happen to anyone, often without warning, it is extremely important to be prepared to change jobs. Periodically update your resume, even if you don’t think you will need it soon. Keep your LinkedIn profile up to date, and keep in contact with your network. Have a few potential references in your back pocket, so that you won’t have to start from scratch if you lose your job. Preparing yourself for all outcomes will allow for a smooth transition if you need to make any change in employment. Fortunately, terminated employees do have certain rights. In addition to a final paycheck, employees could be entitled to things like continued health insurance coverage, extended benefits, severance pay, and unemployment compensation. It is important to know exactly what your rights are as an employee when you lose your job. Jay Warren, counsel in the New York office of Bryan Cave LLP, shares his expertise on employee rights and options for seeking assistance if you have questions about those rights if you believe you have been discriminated against and/or have been subjected to wrongful termination. When a company plans layoffs, it may have a severance plan in effect. If so, severance pay may be provided if your employment is terminated. Statutory rights are those provided by federal or state law. They include unemployment insurance, advance notification of the closing of or a substantial layoff at a facility (depending on the size of the company), anti-discrimination laws, and anti-retaliation laws. When you're not sure about your rights, the best place to start is with the company Human Resources department. Even if they are in the process of terminating your employment, they can answer questions, let you know what company benefits you are eligible for, and guide you through the process of leaving employment. If you feel that you have been discriminated against or haven't been treated according to the law or company policy, you can get assistance. The U.S. Department of Labor, for example, has information on each law that regulates employment and advice on where and how to file a claim. Your state labor department may also be able to assist you, depending on state law and the circumstances. Also, local bar associations often have a referral service and may even have a hotline you can call to find an employment lawyer. Keep in mind that you will need to pay for an attorney's services, although some will provide the initial consultation free of charge.